Acknowledged author wrote CHEMISTRY IN CONTEXT 9 comprising 720 pages back in 2016. Textbook and etextbook are published under ISBN 1259638146 and 9781259638145. 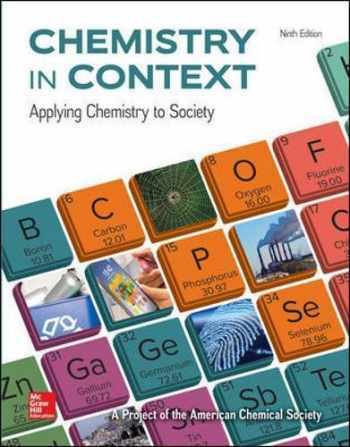 Since then CHEMISTRY IN CONTEXT 9 textbook received total rating of 3.5 stars and was available to sell back to BooksRun online for the top buyback price of $53.34 or rent at the marketplace. Following in the tradition of the first eight editions, the goal of this successful, issues-based textbook, Chemistry in Context, is to establish chemical principles on a need-to-know basis for non-science majors, enabling them to learn chemistry in the context of their own lives and significant issues facing science and the world. The non-traditional approach of Chemistry in Context reflects today's technological issues and the chemistry principles within them. Global warming, alternate fuels, nutrition, and genetic engineering are examples of issues that are covered in Chemistry in Context.